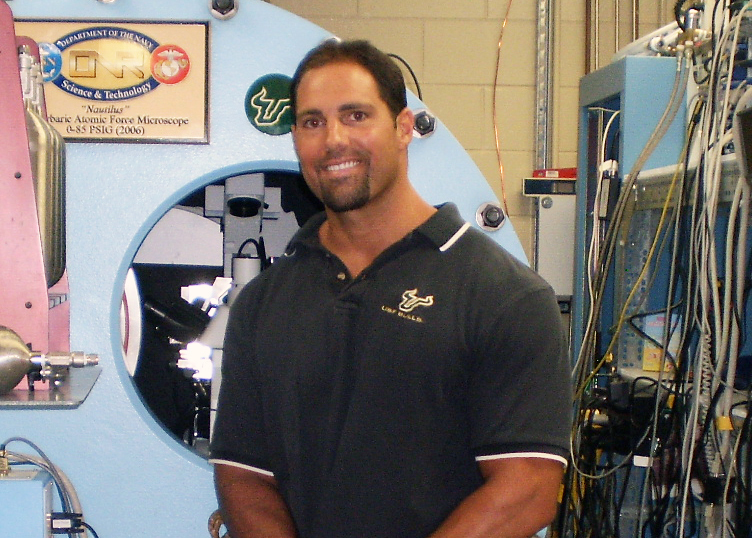 Dr. Dominic D’Agostino is an Associate Professor in the Department of Molecular Pharmacology and Physiology at the University of South Florida. He is also a Research Scientist Institute for Human and Machine Cognition. Dominic received his B.S. in Nutritional Sciences and Biological Sciences as well as his Ph.D. in Neuroscience and Physiology at Rutgers University. Afterwards, Dom conducted postdoctoral research at Wright State University and at the University of South Florida before joining the faculty at the University of South Florida. Dom is here with us today to talk about his research and tell us about his experiences in life and science. Dom and his wife enjoy outdoor activities like going to the beach, hiking, kayaking, mountain biking, and horseback riding. They also do quite a bit of scuba diving together for his wife’s marine biology research on manta rays. Data collection has taken them to Indonesia, Fiji, Palau, Hawaii, and many other phenomenal dive sites. Dom’s lab develops technology that allows them to investigate the molecular, cellular, and physiological changes we experience in extreme environments, including those that would occur undersea, at high altitude, or in space. They are also designing and evaluating metabolic-based therapies as treatments for cancer and other diseases. In high school, Dom wasn’t a particularly good student, but his academic advisor challenged him to take an honors biology course in his senior year. Dom had an existing interest in fitness, nutrition, and understanding the human body as they related to improving his performance in football. As he progressed through the course, Dom became completely engrossed in biology. His interest in physiology and medicine continued to grow in college. Though Dom first got involved in research to fill his CV with activities that would help him get into medical school, he discovered that a career in research was a great fit for his personality and career goals. Certain types of research are considered lower priority for funding by government agencies like the National Institutes of Health (NIH). Unfortunately for Dom, nutrition research is not commonly funded by the NIH. Traditionally, tenure track faculty members in a medical school apply for funding from the NIH, and it is important to secure NIH grants to be successful. Dom failed repeatedly in his applications to the NIH, but he discovered that other organizations including the Department of Defense, the Office of Navy Research, and NASA were more open to funding his research. Dom also faced challenges as a graduate student conducting electrophysiology experiments. The technique he used is very difficult on the types of cells and neurons he was studying. It took him two years to get his first usable data, and there were dozens of times he considered giving up. Throughout Dom’s research career, his resourcefulness and persistence have paid off. The successes Dom finds most rewarding are the achievements of his trainees in the lab. Dom has an amazing group of people working with him. Recently, one of his undergraduate students received an American Physiology Society summer fellowship, as well as two additional awards. She collected fantastic data for this project, and having such excellent students has contributed substantially to Dom’s success in being productive, being competitive for grants, and being awarded tenure. Tripping Over the Truth: The Metabolic Theory of Cancer by Travis Christofferson, Ego is the Enemy by Ryan Holiday, A Man on the Moon: They Voyages of the Apollo Astronauts by Andrew Chaikin. During his PhD program, Dom’s advisor asked him to travel to New Zealand to present their work. At the time, Dom had never been outside of the U.S., and it was a truly surreal experience. He engaged audiences in the cities of Auckland, Christchurch, and Rotorua. This was a fantastic opportunity for him to share his science and connect with other scientists in the field. Dom enjoyed the beautiful landscapes of New Zealand and was able to participate in different tours with his scientific colleagues as well. One postdoc Dom worked with previously knew about his serious fear of spiders and intense startle reflex. They did some of their work in basement labs where there was no shortage of spiders. The postdoc would collect the spiders and put them in places where Dom was likely to encounter them. This prankster spirit permeates other groups Dom has worked with as well. Recently, one of Dom’s colleagues installed a historic train whistle into the hypobaric chamber so that when the chamber was pressurized, he could release some of the pressure using the whistle. It was incredibly loud and made them all jump. It has been fun to work with people who don’t take themselves too seriously and can make you laugh. You may begin a project with a specific hypothesis, but it is important to remain open and adaptable to what your data and the findings of others may show. As scientists, it is our job to seek the truth and let no kind of bias prevent us from this mission. Seek mentors who are flexible in their thinking and have integrity. Find people who have achieved what you want to achieve, and figure out how they got to that point. The primary focus of Dom’s laboratory is developing and testing metabolic-based therapies, including ketogenic diets, ketone esters, ketone supplements and metabolic-based drugs. Their research also explores the use of these metabolic therapies for a broad range of disorders linked pathophysiologically to metabolic dysregulation, including seizures, neurological disorders, wound healing, muscle wasting and cancer. Dom’s laboratory uses in vivo and in vitro techniques to understand the physiological, cellular and molecular mechanism of metabolic therapies. This research is supported by the Office of Naval Research (ONR), the Department of Defense (DoD), private organizations, and foundations. With a wide range of research interests, Dom holds membership in the Aerospace Medical Association, Undersea and Hyperbaric Medicine Society, Society of Neuroscience, and the American Physiological Society. He also serves on the Editorial Board for the Journal of Applied Physiology. In addition, Dom teaches students of the Morsani College of Medicine and the Department of Molecular Pharmacology and Physiology, with a focus on such topics as neuropharmacology, medical biochemistry, cell metabolism, and signaling. Beyond his scientific pursuits, Dom has volunteered his time, energy, and resources to a variety of worthy causes in the United States and abroad, helping children and families in underserved communities. A member of Tampa International Mission Empowerment (T.I.M.E. ), Dom frequently travels with this group on humanitarian missions to Mexico and Honduras, where he and his colleagues provide essential services to orphanages and other organizations in need. In addition, Dom serves as a Big Brother/mentor for Big Brothers and Big Sisters of America, volunteers at the Humane Society of Tampa Bay, and helps various nonprofit organizations.